This fascinating hill, with its tower on the summit, the distinctive terracing, represented in the opening ceremony of the London Olympics, has drawn people to climb its slopes for millennia. Visible from far away and from all roads leading to Glastonbury it acts as a beacon for the approaching traveller. The Tor is the tallest of the four hills of Glastonbury and, unusual in its shape, it rises steeply out of the Somerset Levels to more than 500 feet (158 metres) in height. It is a natural hill, but the specific features and shape of the Tor, its location and function in the landscape has given rise to a wealth of myths, legends and evolving stories, from ancient times to the present. A climb to the summit will reward you with stunning views for miles. The Tor has been seen as a magnetic power-point and vortex, a crossroad of multiple ley-lines including the St Michael Line, a converging point for UFO’s, a ceremonial labyrinth and a place of re-birth and initiation. It has been the site of an ‘Arthurian’ stronghold, a Christian cross and chapel, a monastic community, a beacon fire and possibly a Romano-British pagan temple. It is also now regarded as housing a subterranean aquifer feeding some of the springs on the island. In 1539 the last Abbot of Glastonbury Abbey, Richard Whiting, was hanged on the Tor between two of his monks during the turbulent times of the Dissolution. The first significant occupation of the Tor dates from the Early Middle Ages (c.500-1000 AD). Remains of a 5th century fort have been found and other discoveries from this period include: a metalworker's forge; postholes; two 6th-century burials of teenagers oriented north-to-south; fragments of 6th-century Mediterranean amphorae; many animals bones; and a worn hollow bronze head which may have topped a Saxon staff. A second phase of occupation of the Tor between 900 and 1100 AD is known from the discovery of the head of a cross and what were probably monastic cells cut into the rock on the summit. The fort was replaced by St. Michael’s church, which remained until 1272. The existence of a monastic community on the Tor is confirmed by a charter of 1243 granting permission for a fair to be held at the Monastery of St. Michael on the hill. On 11th September 1275 an earthquake that was felt in London, Canterbury and Wales destroyed the church. A second church was built in the 1360’s, which survived until the Dissolution of the Monasteries in 1539. Now only the tower survives. Drawings from the 1800's show a tower in some state of decay with the north-eastern corner reduced to a rubble layer. This part of the tower was restored in the 19th century. In 1948 further restoration work was undertaken on the Tower. The lias floor was laid in 1984 to replace an earth floor that was constantly dug by treasure seekers. Sites on high places are often dedicated to St. Michael the Archangel. According to various writings, St. Michael was said to have miraculously appeared in over 400 places throughout Britain and Europe during the 4th and 5th centuries. At a large percentage of these sites he was supposed to have slain dragons. These sites were often pagan sites associated with dragons and serpents, symbolically used to depict the mysterious forces of the underworld. There is much ancient iconography depicting serpents and dragons sinuously wound round the great Earth Tree whose roots reach into the underworld. Christian teaching associates St. Michael with Last Things – the end of time and the end of life. As such he has four main functions: rescuing the souls of the faithful from the power of the enemy, especially at the hour of death; calling human souls away from earth and bringing them to judgement; fighting against Satan and serving as the champion of the people. 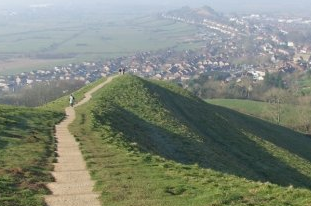 Similarities can be drawn with the pagan beliefs that the Tor is home to Gwyn ap Nudd who protects the dead on their way to Gwynfa ('Paradise') - Paradise Lane still runs around the foot of the Glastonbury Tor. Many pre-Christian legends have references to giants or normal persons who 'speared a serpent' or 'captured the dragon forces' at a specific site by the placement of a great stone into the body of the earth. Even more telling is the fact that many Christian sacred sites were, prior to the arrival of Christianity, known as dragon's dens and serpent's lairs. St. Michael is often depicted as the ‘dragon-slayer’ – his spear being driven into the body of the dragon. Early Christianity believed the gods of the old religion to be fallen angels, or demons and built many churches dedicated to St. Michael on the old religious sites and sacred mounds to contain the energies of the old gods. Two reliefs on St Michael's tower show St Michael holding the scales of justice and St Brigid milking a cow. St Brigid was originally the Celtic goddess Bride who, at her festival of Imbolc in February, presides over the lactation of animals. The Tor is now in the keeping of the National Trust, who are responsible for up-keep and maintenance of the whole site and offer free, unlimited access. There are two maintained pathways leading to the summit of the hill. The first one can be accessed from the corner of Well House Lane / Chilkwell St. opposite Chalice Well Gardens. It is also called the ‘Ceremonial Route’ or the long route, threading its way along the spine and the length of the Tor and probably in reference to the traditional way pilgrims and worshippers would approach the sacred site – e.g. as part of a ceremony. The other pathway is much steeper but shorter. Access can be gained from the top end of Well House Lane through a kissing gate. There is disabled parking only here. However, the Tor bus runs a return service every half an hour from St. Dunstan's car park on Magdalene Street - Service 196 - operating 1 April to 30 September only.